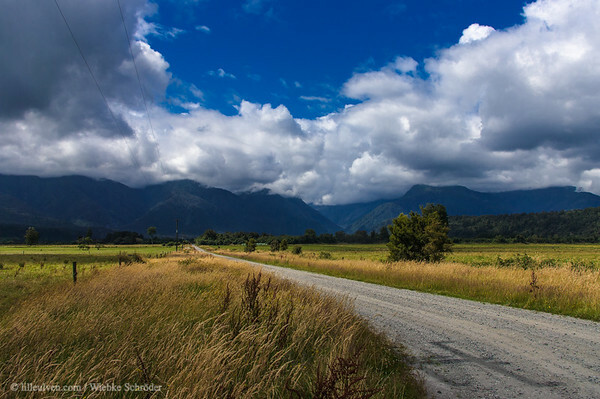 A selection of Lille Ulven's travel photos from her journey through New Zealand. 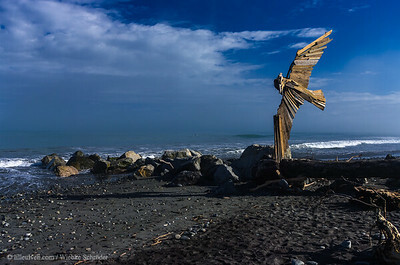 Hokitika, West Coast, New Zealand Driftwood Art and Black Sand is an annual festival in Hokitika where people build their own art from what they can find on the beach. uuid="D1902017-C0BB-4FD9-B6AD-FE56DC8F4626" id="New Zealand lilleulven.com 20130124_091505_NZ_West Coast_Hokitika_Hokitika Beach_www.LilleUlven.com.DNG New Zealand South Lilleulven.com"
Milford Sound, Southland, New Zealand Milford Sound Milford Sound/Piopiotahi is 120 km by road from Te Anau. Its surroundings are dominated by Mitre Peak, which rises 1,700 m out of the water. 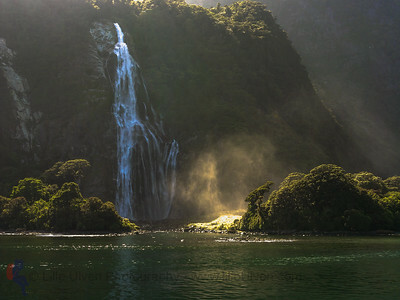 From valleys gouged by glaciers, impressive waterfalls (Bowen and Stirling) pour into the sea. The sound’s Māori name, Piopiotahi, means a single thrush: the mythical hero Māui is said to have brought a thrush with him from Hawaiki. 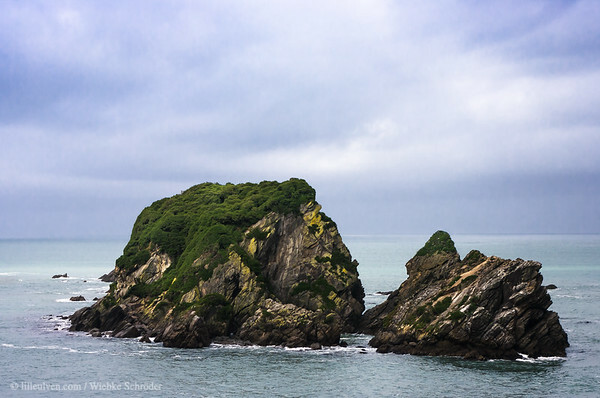 When Māui was crushed between the thighs of Hine-nui-te-pō (the goddess of death), the bird fled south, to give its name to the sound. The combination of heavy rainfall (6,300 mm per year) and dense bush produces a permanent layer of fresh water on the surface of the sound, which reduces light levels in the water beneath. Many species live here that would normally only be found in deep water, beyond diving range – a phenomenon called ‘deep water emergence’. As in other fiords, divers can explore black coral trees, and lustrous red corals beneath them. Source: David Grant. 'Southland places - Milford Sound and north', Te Ara - the Encyclopedia of New Zealand, updated 13-May-15 URL: http://www.TeAra.govt.nz/en/southland-places/page-12 uuid="1B778935-3DCB-40AA-9B75-BF22BC5CEAF9" id="New Zealand lilleulven.com 20130127_090605_NZ_Southland_Milford Sound__www.LilleUlven.com.DNG New Zealand South Lilleulven.com"
Wellington, Wellington, New Zealand uuid="6ED45324-5DDB-4BD6-9212-FBCD71C97756" id="New Zealand lilleulven.com 20130121_075545_NZ_Wellington_Wellington__www.LilleUlven.com.DNG New Zealand North Lilleulven.com"
The Neck, Otago, New Zealand Road to Wanaka along Lake Hawea. 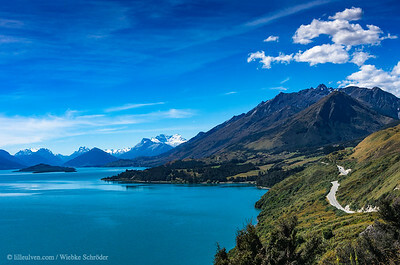 Both Lake Wanaka and its close neighbour, Hawea, occupy basins excavated by successive advances of great glacial systems that rose on the main divide between Mount Aspiring and the head of the Hunter River. The ice occupying the two lake basins was connected over a low pass now called the Neck, and the lake basins had a similar glacial history. Ice extended over the Wanaka area south-east down the Clutha River, at least as far as the Lindis River Junction, in later Pleistocene time. Ice submerged Mount Barker and Mount Iron, sculpturing Mount Iron into a typical “roche moutonnée” shape. A prominent loop of terminal moraine encircles the lower end of the lake, encloses Wanaka township, and marks the limits of the last of the great Pleistocene ice advances. The early Lake Wanaka was formed during the retreat of the ice terminal northwards from this loop about 10,000 years ago. It stood at first at a much higher level than at present. The outlet became entrenched in the glacial silts forming part of this moraine, and water level sunk in post-glacial time to its present 928 ft above sea level. Source: How to cite this page: . 'WANAKA, LAKE', from An Encyclopaedia of New Zealand, edited by A. H. McLintock, originally published in 1966. Te Ara - the Encyclopedia of New Zealand, updated 22-Apr-09 URL: http://www.TeAra.govt.nz/en/1966/wanaka-lakeThis photo is also published in Lille Ulven Photography's New Zealand calendars in A2, A3, A4 and A5 format. uuid="0B171571-1FC1-4FA5-B617-AD0B6AB77EAD" id="New Zealand lilleulven.com 20130125_155029_NZ_Otago_The Neck__www.LilleUlven.com.DNG New Zealand South Lilleulven.com"
Mount Creighton, Otago, New Zealand A nice view over the shore of Lake Wakatipu close to Glenorchy on the South Island of New Zealand. The lake as been created by a glacier that carved out the canyon 15,000 years ago. Even though it is a relatively thin canyon at its deepest it reaches 399m. 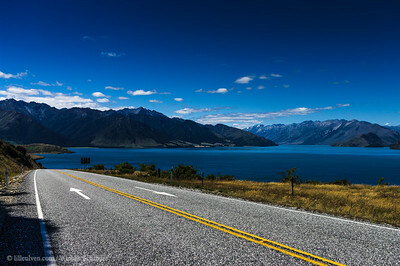 With its total length of 84 km it is the second largest lake on the South Island. Still unexplained by science the lake rises and falls about 12 cm (5 inch) every hour - the Maori legend says that a giant who abducted a chiefs daughter was burned to death. 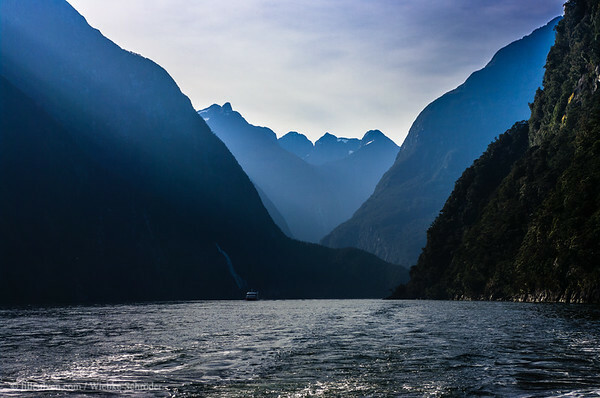 So the shape of the lake reassembles the sleeping giant - with the head at Glenorchy and the knees at the hight of Queenstown - and the rising and falling of the lake is due to the heartbeat of the giant, since his heart did not stop beating even though he was burned. 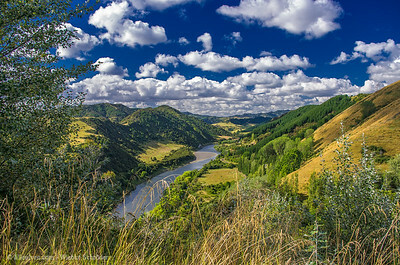 here uuid="A9E618FC-B950-4758-9197-44A2C44A5D5A" id="New Zealand lilleulven.com 20130127_155853_NZ_Otago_Glenorchy__www.LilleUlven.com.DNG New Zealand South Lilleulven.com"
Mount Eden, Auckland, Auckland, New Zealand Skyline of Auckland as seen from Mt. Eden. In the foreground you see the crater of the now extinct volcano that Mount Eden is, while in the background you see the skyline of Auckland on a cloudy, warm and humid summer's day. 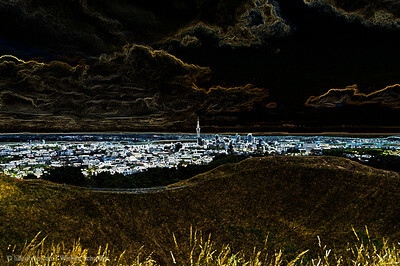 Mount Eden is - with its 196 meters in hights - the highest volcano in Auckland. Its Maori name is Maungawhau, which means hill of the Whau tree. The lower areas of the hill have been used, during Maori inhabitation, as gardens and terrasses. Today Mount Eden is protected by the Historic Places act from 1980. This photo is also published in Lille Ulven Photography's New Zealand calendars in A2, A3, A4 and A5 format. uuid="811068C0-C859-4267-9871-2A9FF9834D35" id="New Zealand lilleulven.com 20130113_113636_NZ_Auckland_Auckland_Skyline of Auckland_www.LilleUlven.com.DNG New Zealand North Lilleulven.com"
Tekapo, Canterbury, New Zealand uuid="139AD7E5-499D-4169-BC7D-5E246772694D" id="New Zealand lilleulven.com 20130129_105017_NZ_Canterbury_Tekapo__www.LilleUlven.com.DNG New Zealand South Lilleulven.com"
Harihari, West Coast, New Zealand Still pretty close to HariHari I am riding my bike toward Franz Josef and into the Southern Alps. So maybe this is the last day of flat roads and steep climbs will wait for me from tomorrow onwards? I will find out for sure...anyway the scenery invites you to stay longer to explore more...if the schedule just had not been this tight... uuid="9CC9C67A-C7BD-480B-84D2-1EBDA49D511B" id="New Zealand lilleulven.com 20130124_114422_NZ_West Coast_Harihari_Hari Hari_www.LilleUlven.com.DNG New Zealand South Lilleulven.com"
Whanganui, Manawatu-Wanganui, New Zealand After the rain, there will be the sunshine again - or something similar. Well after the rain of the day before, we were lucky to have another ride in beautiful weather from Tongariro National Park to Wanganui. Cycling here does not mean too many climbs to master...until you get to the end of the valley where a "big climb" is waiting for you. I could see the climb waiting while struggling on my bike to do a less steep climb at around 4-5km/h wondering how on earth I should be able to reach the top. But the miracle happened...I was better on the big climb than its little brother and could enjoy the view back from the top. uuid="2368CD9B-CACC-45E1-AE99-553CDB148FEA" id="New Zealand lilleulven.com 20130118_172304_NZ_Manawatu-Wanganui_Whanganui_Whanganui River Valley_www.LilleUlven.com.DNG New Zealand North Lilleulven.com"
Lake Matheson, Fox Glacier, West Coast, New Zealand Reflection of Aoraki (Mt. Cook) and Rarakiora (Mt. Tasman) in Lake Matheson, near Fox on New Zealands South Island. The photo is taken at 7:17 a.m. - luckyly we did not have many clouds to deal with but could witness part of the sunrise as well. Lake Matheson was formed when the glacier Te Moeka o Tuave retreated from its last major advance 14,000 years ago, and left a depression which later filled with water. uuid="82B0D380-A506-4AF6-9E75-B310EB1CF5C6" id="New Zealand lilleulven.com 20130125_071600_NZ_West Coast_Fox Glacier_Lake Matheson_www.LilleUlven.com.DNG New Zealand South Lilleulven.com"
Fiordland National Park, Milford Sound, Southland, New Zealand Bowen Falls is the highest and most powerfull waterfall with its 162m in the Milford Sound. It belongs to the so called horsetailwaterfalls. uuid="38BCAE50-5CF2-446F-A2B0-35AF88AF2A46" id="New Zealand lilleulven.com 20130127_104117_NZ_Southland_Milford Sound_Bowen Falls - Milford Sound_www.LilleUlven.com.DNG New Zealand South Lilleulven.com"
Westland National Park, West Coast, New Zealand Franz Josef Glacier, one of the two spectacular Westland glaciers, with ice descending into the rainforest. Only Franz Josef Glacier and Fox Glacier reach sealevel. 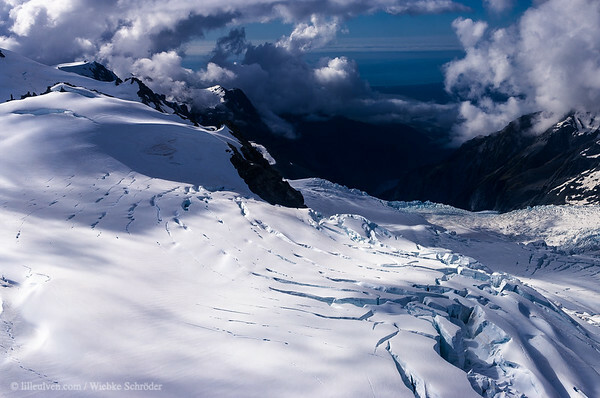 Franz Josef Glacier has a high-altitude snofield of 20 square kilometers, which funnels vast amounts of ice into narrow valleys - an effect like pressing on a tube of toothpaste. The ice is pushed right down the steep valleys to the coast, reaching a speed of several meters per day. First upon reaching the warmer air and frequent rainfalls of sealevel the ice starts to melt. 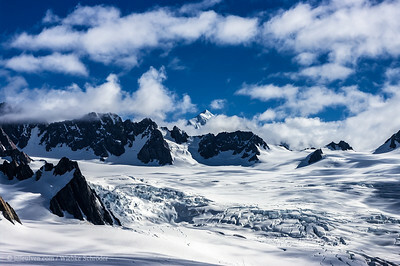 Julius Haast was the first geologist and explorer to visit these glaciers in 1864, when the front edge of Franz Josef stood near Sentinel Rock, several kilometers further down the valley than today. According to Māori mythology Fox Glacier is the point where the ancestor Tuawe fell to his death while exploring the area and the bed of the glacier became his final resting place (moeka), which is why the name of Fox Glacier in Maori is Te Moeka o Tuawe. His lover Hine Hukatere wept, and her everlasting tears formed the Franz Josef Glacier or Kā Roumata o Hine Hukatere. Source: Eileen McSaveney. 'Glaciers and glaciation - Tasman, Franz Josef and Fox glaciers', Te Ara - the Encyclopedia of New Zealand, updated 13-Jul-12 URL: http://www.TeAra.govt.nz/en/glaciers-and-glaciation/page-2 uuid="D210F0A5-9457-4F7E-B73E-93A66F407A6B" id="New Zealand lilleulven.com 20130124_174445_NZ_West Coast_Westland National Park_Franz Joseph Glacier_www.LilleUlven.com.DNG New Zealand South Lilleulven.com"
Tongariro National Park, Manawatu-Wanganui, New Zealand Mount Ruapehu in the Tongariro National Park in New Zealand. 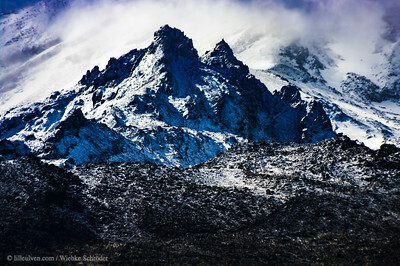 The name of the mountain means in English "Exploding hole" as it is actually an active stratovolcano of 2757 m (9177 feet) hight and is with that the highest point of the North Island (Te Ika-a-Māui) of New Zealand (Aotearoa). The area is also known from the Lord of the Rings movies as Mordor. uuid="F5B676A7-0402-491F-B228-AFF6B445E566" id="New Zealand lilleulven.com 20130118_091658_NZ_Manawatu-Wanganui_Tongariro National Park_Mt. Ruapehu (Mordor)_www.LilleUlven.com.DNG New Zealand North Lilleulven.com"
Westland National Park, West Coast, New Zealand From the top of the Franz Josef Glacier in New Zealand you can see the coast of the Tasman Sea in the distance, through the window-of-clouds. This glacier is one of the very few who's tongue actually ends in the rainforest, this is unique to New Zealand. Of course since glaciers are retreating here too this might not be the case much longer. uuid="BB776478-2883-4C16-9282-69214D10FE1C" id="New Zealand lilleulven.com 20130124_173823_NZ_West Coast_Westland National Park_Franz Joseph Glacier_www.LilleUlven.com.DNG New Zealand South Lilleulven.com"
Cape Foulwind, West Coast, New Zealand Cape Foulwind’s first European “visitor” was, in 1642, Abel Tasman. He named it Rocky Cape. But when in 1770 Captain Cook arrived here on his ship, the Endeavour, he renamed it to Cape Foulwind, as he was especially unlucky with the weather on the day he arrived and his ship was actually blown out to sea. uuid="AC433D6C-393F-4F01-83BC-65056A9E69EE" id="New Zealand lilleulven.com 20130123_091548_NZ_West Coast_Cape Foulwind__www.LilleUlven.com.DNG New Zealand South Lilleulven.com"
Rotorua, Bay of Plenty, New Zealand Motutara - Sulphur Point, Roturua. Motutara means Bird's Island in Māori, so I assume that this little island in Lake Rotorua was already inhabited by many birds when the Lake and Island were discovered by the two Māori Ihenga and his uncle Kahumatamomoe. 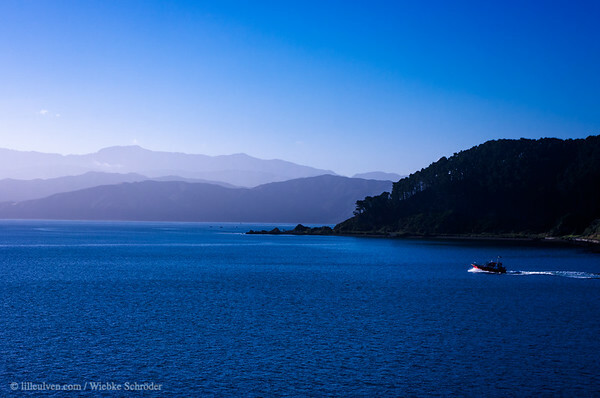 The full name of Lake Rotorua in Māori is Te Rotorua-nui-a Kahumatamomoe, meaning "the lake of Kahumatamomoe, discovered second" as before arriving at Rotorua they had already discovered Lake Rotoiti or in its full Māori name Te Rotoiti-kite-a-Ihenga, meaning "The small lake discovered by Ihenga", it later turned out the lake was not as small as they first had thought though. uuid="C790ACCF-AD4A-4CE2-84EF-0AE27B0AE93E" id="New Zealand lilleulven.com 20130117_092530_NZ_Bay of Plenty_Rotorua_Motutara - Sulphur Point, Roturua_www.LilleUlven.com.DNG New Zealand North Lilleulven.com"
Tekapo, Canterbury, New Zealand Lake Pukaki with Aoraki (Mount Cook) in the fog. Waking up before the last day of riding my bike in New Zealand to fog an clouds. But it was the day when we were supposed to see Aoraki (Mount Cook) rising over Lake Pukaki...that doesn't sound to good for any kind of photography. How should be be able to spot the mountain, which has a top cover to some degree in permanent ice, in these conditions after all? But giving up before even getting there is not an option either... So I guess this is Mount Cook over Lake Pukaki in the fog then. uuid="5CE9FA7E-3959-4014-9CAD-14D57C8E3DE7" id="New Zealand lilleulven.com 20130129_095113_NZ_Canterbury_Tekapo_Lake_Pukaki_www.LilleUlven.com.DNG New Zealand South Lilleulven.com"
Mount Eden, Auckland, Auckland, New Zealand Skyline of Auckland as seen from Mt. Eden. In the foreground you see the crater of the now extinct volcano that Mount Eden is, while in the background you see the skyline of Auckland on a cloudy, warm and humid summer's day. Mount Eden is - with its 196 meters in hights - the highest volcano in Auckland. Its Maori name is Maungawhau, which means hill of the Whau tree. The lower areas of the hill have been used, during Maori inhabitation, as gardens and terrasses. Today Mount Eden is protected by the Historic Places act from 1980. This photo is also published in Lille Ulven Photography's New Zealand calendars in A2, A3, A4 and A5 format. uuid="070B85C4-A991-4D21-9B6E-7D0ABB78AC5B" id="New Zealand lilleulven.com 20130113_113636_NZ_Auckland_Auckland_Skyline of Auckland_Creative_www.LilleUlven.com.psd Creative World lilleulven.com"
Te Aroha, Waikato, New Zealand A part of the road toward Te Aroha as we saw it on our second day of riding our bikes uuid="B8637E12-E131-4643-8DCE-2BA2BB8D5E2B" id="New Zealand lilleulven.com 20130116_094215_NZ_Waikato_Te Aroha_Te Aroha Road_www.LilleUlven.com.tif New Zealand North Lilleulven.com"
Hokitika, West Coast • New Zealand Driftwood Art and Black Sand is an annual festival in Hokitika where people build their own art from what they can find on the beach. This photo is also published in Lille Ulven Photography's New Zealand calendars in A2, A3, A4 and A5 format. Wellington, Wellington • New Zealand Wellington Harbor. This photo is also published in Lille Ulven Photography's New Zealand calendars in A2, A3, A4 and A5 format. The Neck, Otago • New Zealand Road to Wanaka along Lake Hawea. Both Lake Wanaka and its close neighbour, Hawea, occupy basins excavated by successive advances of great glacial systems that rose on the main divide between Mount Aspiring and the head of the Hunter River. The ice occupying the two lake basins was connected over a low pass now called the Neck, and the lake basins had a similar glacial history. Ice extended over the Wanaka area south-east down the Clutha River, at least as far as the Lindis River Junction, in later Pleistocene time. Ice submerged Mount Barker and Mount Iron, sculpturing Mount Iron into a typical “roche moutonnée” shape. A prominent loop of terminal moraine encircles the lower end of the lake, encloses Wanaka township, and marks the limits of the last of the great Pleistocene ice advances. The early Lake Wanaka was formed during the retreat of the ice terminal northwards from this loop about 10,000 years ago. It stood at first at a much higher level than at present. The outlet became entrenched in the glacial silts forming part of this moraine, and water level sunk in post-glacial time to its present 928 ft above sea level. Source: How to cite this page: . 'WANAKA, LAKE', from An Encyclopaedia of New Zealand, edited by A. H. McLintock, originally published in 1966. Te Ara - the Encyclopedia of New Zealand, updated 22-Apr-09 URL: http://www.TeAra.govt.nz/en/1966/wanaka-lakeThis photo is also published in Lille Ulven Photography's New Zealand calendars in A2, A3, A4 and A5 format. 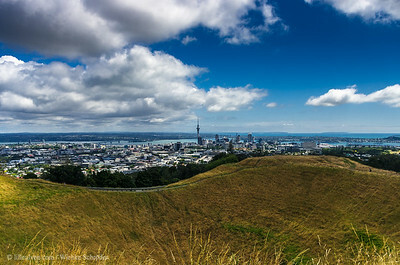 Mount Eden, Auckland, Auckland • New Zealand Skyline of Auckland as seen from Mt. Eden. In the foreground you see the crater of the now extinct volcano that Mount Eden is, while in the background you see the skyline of Auckland on a cloudy, warm and humid summer's day. Mount Eden is - with its 196 meters in hights - the highest volcano in Auckland. Its Maori name is Maungawhau, which means hill of the Whau tree. The lower areas of the hill have been used, during Maori inhabitation, as gardens and terrasses. Today Mount Eden is protected by the Historic Places act from 1980. This photo is also published in Lille Ulven Photography's New Zealand calendars in A2, A3, A4 and A5 format. Whanganui, Manawatu-Wanganui • New Zealand After the rain there will be sunshine again - or something similar. Well after the rain of the day before, we were lucky yo have another ride in beautiful weather from Tongariro National Park to Wanganui. Cycling here does not mean too many climbs to master...until you get to the end of the valley where a "big climb" is waiting for you. I could see the climb waiting while struggling on my bike to do a less steep climb at around 4-5km/h wondering how on earth I should be able to reach the top. But the miracle happened...I was better on the big climb than its little brother and could enjoy the view back from the top.This photo is part of the Lille Ulven Photography New Zealand calendars. Lake Matheson, Fox Glacier, West Coast • New Zealand Reflection of Aoraki (Mt. Cook) and Rarakiora (Mt. Tasman) in Lake Matheson, near Fox on New Zealands South Island. The photo is taken at 7:17 a.m. - luckyly we did not have many clouds to deal with but could witness part of the sunrise as well. 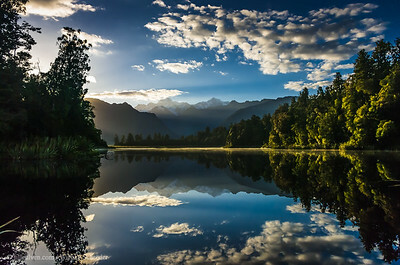 Lake Matheson was formed when the glacier Te Moeka o Tuave retreated from its last major advance 14,000 years ago, and left a depression which later filled with water. This photo is also published in Lille Ulven Photography's New Zealand calendars in A2, A3, A4 and A5 format. 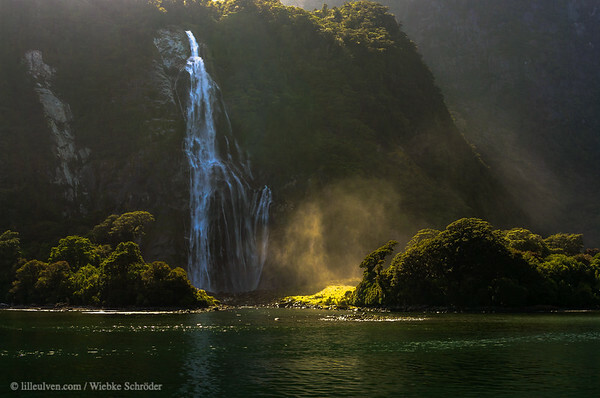 Fiordland National Park, Milford Sound, Southland • New Zealand Bowen Falls is the highest and most powerfull waterfall with its 162m in the Milford Sound. It belongs to the so called horsetailwaterfalls. This photo is part of the Lille Ulven Photography New Zealand calendar in square format. Tongariro National Park, Manawatu-Wanganui • New Zealand Mount Ruapehu in the Tongariro National Park in New Zealand. The name of the mountain means in English "Exploding hole" as it is actually an active stratovolcano of 2757 m (9177 feet) hight and is with that the highest point of the North Island (Te Ika-a-Māui) of New Zealand (Aotearoa). The area is also known from the Lord of the Rings movies as Mordor. This photo is also published in Lille Ulven Photography's New Zealand calendars in A2, A3, A4 and A5 format. Westland National Park, West Coast • New Zealand From the top of the Franz Josef Glacier in New Zealand you can see the coast of the Tasman Sea in the distance, through the window-of-clouds. This glacier is one of the very few who's tongue actually ends in the rainforest, this is unique to New Zealand. Of course since glaciers are retreating here too this might not be the case much longer. 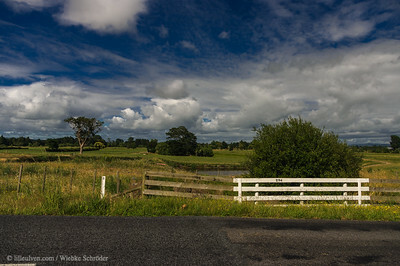 This photo is part of the Lille Ulven Photography New Zealand calendar in square format. Whakarewarewa, Rotorua, Bay of Plenty • New Zealand The Pohutu geyser is one of the most famous geysers, which is located in Te Puia and is known to erupt about every 50 minutes. Not as in other places because someone throws a piece of soap into it, but because the water reservoir has filled up and the water inside has gotten heated up enough to pass through the bottleneck-valve toward the surface. Whakarewarewa, Rotorua, Bay of Plenty • New Zealand In the tradition of the Māori, geysers, such as Pōhutu, are gifts from the gods. 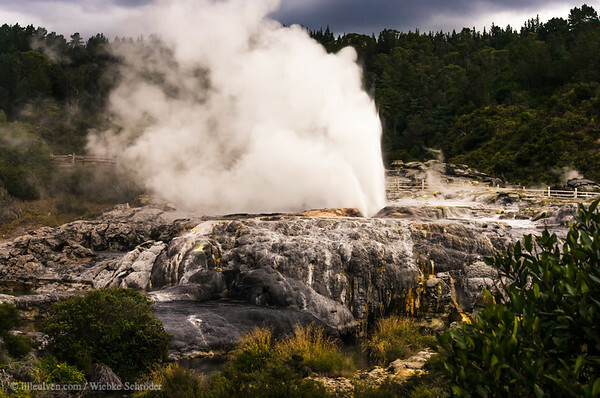 According to the local belief the Te Whakarewarewa Thermal Valley was formed when two sisters, Te Pupu and Te Hoata, traveled beneath the earth to search for their brother. 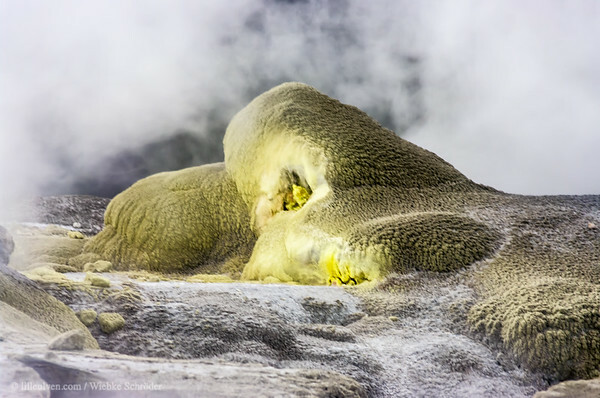 While getting closer to him they lifted their heads up above the surface and by that created the geysers and geothermal hotspots along the way. This photo is also published in Lille Ulven Photography's New Zealand calendars in A2, A3, A4 and A5 format. Rotorua, Bay of Plenty • New Zealand Motutara - Sulphur Point, Roturua. 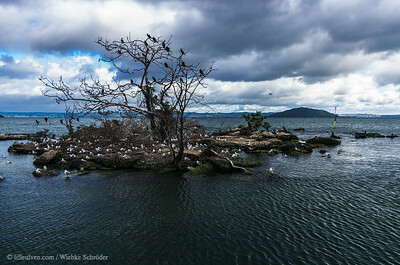 Motutara means Bird's Island in Māori, so I assume that this little island in Lake Rotorua was already inhabited by many birds when the Lake and Island were discovered by the two Māori Ihenga and his uncle Kahumatamomoe. The full name of Lake Rotorua in Māori is Te Rotorua-nui-a Kahumatamomoe, meaning "the lake of Kahumatamomoe, discovered second" as before arriving at Rotorua they had already discovered Lake Rotoiti or in its full Māori name Te Rotoiti-kite-a-Ihenga, meaning "The small lake discovered by Ihenga", it later turned out the lake was not as small as they first had thought though. 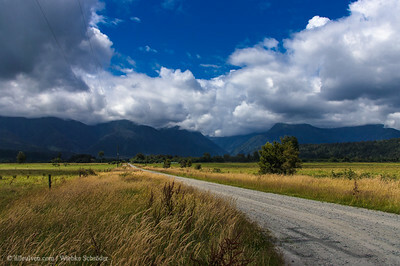 This photo is part of the Lille Ulven Photography New Zealand calendar in square format. 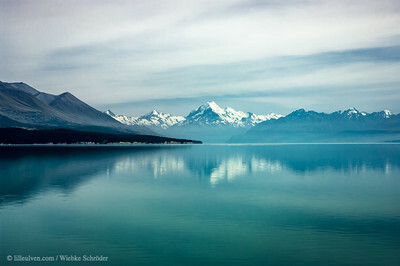 Tekapo, Canterbury • New Zealand Lake Pukaki with Aoraki (Mount Cook) in the fog. Waking up before the last day of riding my bike in New Zealand to fog an clouds. But it was the day when we were supposed to see Aoraki (Mount Cook) rising over Lake Pukaki...that doesn't sound to good for any kind of photography. How should be be able to spot the mountain, which has a top cover to some degree in permanent ice, in these conditions after all? But giving up before even getting there is not an option either... So I guess this is Mount Cook over Lake Pukaki in the fog then. 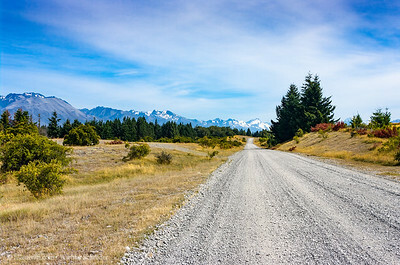 This photo is also published in Lille Ulven Photography's New Zealand calendars in A2, A3, A4 and A5 format.